Carmen González, known to many as Carmina, passed away on Sunday, February 8, 2015. She was 95 years old. She served, for many years, as the sacristan for the Parish of San Sebastian de Garabandal. I believe she is in Heaven. She was the owner of a LARGE CRUCIFIX which was “KISSED” by the Blessed Mother at the time of the apparitions. She often made this Crucifix available for pilgrims to kiss. 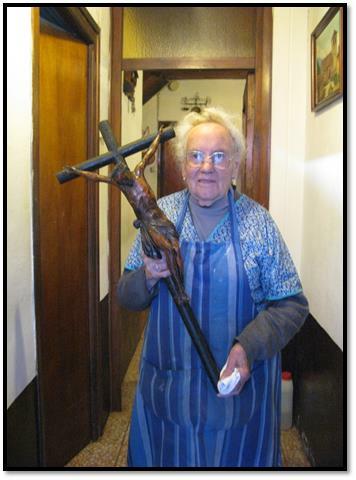 Her health and her eyesight began to fail, so when she was no longer well enough to remain in her home, she gave this Crucifix to the church. In 2015, this Crucifix was made available after the Holy Sacrifice of the Mass for pilgrims to kiss, as Carmina would have wanted it to be. God Bless You…Pray for Me.